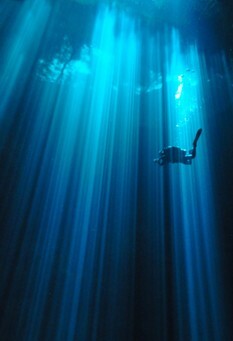 Been diving in Cenote El Pit? Please Vote! The road is long and winding, through dense Yucatan jungle from which emerges the occasional iguana or small indigenous mammals, such as a coatimundi or a fox. Finally appears a discreet right-hand turn. There deep in the jungle is a literal pit; a hole in the ground with the water’s surface about 7 meters below. 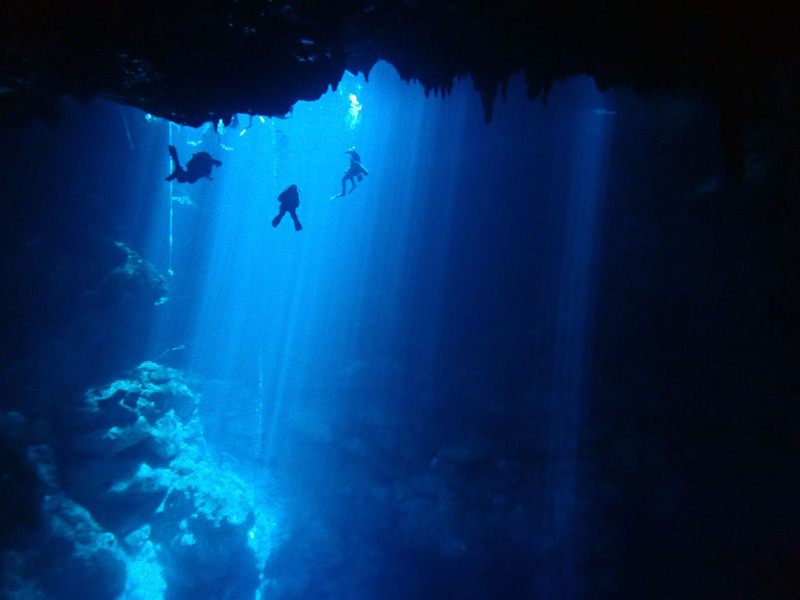 The Pit is the deepest known cave in the Yucatan, with a maximum depth of 119 meters, though the typical recreational dive is held hovering above 30 meters. Within this depth is a wealth of underwater treasures to behold. My favorite way to dive the Pit is to really take it slow, fighting your adrenaline, sinking gradually along the wall of the cenote, slipping through the halocline into the salt water, and then settling just above the wisp of the hydrogen-sulfide cloud. I then swim away from the open water, into the deep cavernous zone, only to turn around to catch the luminous light rays that pierce straight down to depth, causing a sharp silhouette of the impressive stalactites that reach down from the lip of the cavern ceiling. This view provides a sense of the sheer scale of the cenote, which when seen from above provides very little indication of the massive amplitude that is found below. It rightfully earns a place on most divers’ best dives lists. Mosquitos nibble at my neck as I carry heavy dive equipment through the dense Yucatan jungle. As if out of nowhere we find a vast hole in the forest floor. Light rays penetrate the blue waters below; a myriad of vegetation protrudes from the water surface, revealing a hidden world. An arduous start to the day does not relent, a 6-metre jump from the jungle above into the water below. As I descend through the foliage strewn surface the visibility is truly breath-taking. At 18 metres a halocline of hydrogen sulfide lies like a cloud in a clear sky. For a moment the perfect visibility is compromised, yet through the layer and out the other side the visibility is unparalleled yet again. As I begin my descent, I explore the cavern itself, finding my way to the edges of the pit. Huge stalactites hang from the walls, and I weave my way between them, before surfacing to the jungle world above. El Pit (the Pit) is a very deep and large beautiful Cenote that offers one of the most amazing ambiance and light. Map of Yucatan Peninsula, Cenote El Pit dive site.